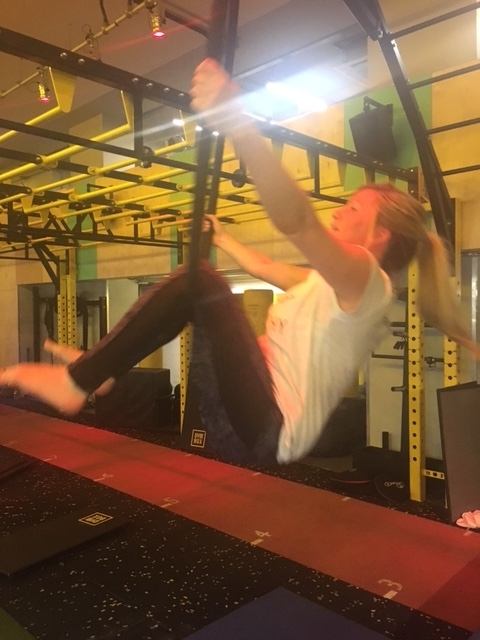 I had done a slight intro to Aerial Hoops before and really got a feel for it – so of course my inquisitive nature got the better of me and I had to try the hour and a half class at Gym Box (taken by Flying fantastic) last weekend. After a small warm up we were split into groups – one for those who had a bit of experience and beginners like me. And, I’ll be honest with you, I was scared of the hoop – it was quite high up and how the hell did they expect me to get up there anyway? 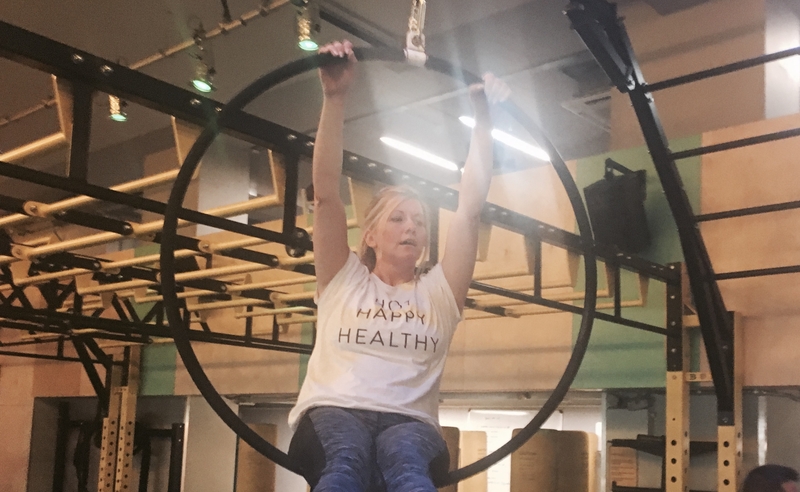 We started with some moves to get us used to the hoop, including hanging off it and moving our upper bodies to get used to the sensation that we would be using that part of our body a lot. In an attempt to get up on the hoop she advised beginners to use our feet to balance on the hoop, once you got the hang of it you could elegantly use your whole upper body to swing your legs back then loop your legs over the ring – I assure you mine was anything but elegant! After some practising ( and sore hands ) you will finally get to sitting on the hoop ( you will I promise you). While you hang upside down from it you have to use your abs to pull yourself up, edging your arms up the sides of the hoop as you do. I’d done all this before but it really does takes practice. And once you are up you can do all sorts of moves – the splits, man in the moon and all the other complicated names I can’t remember. I wasn’t so sure about man on the moon – basically where you move your body sideways on the hoop and move your feet up to the top – you have to use your body to balance by leaning on your shoulder. Not the easiest thing to do! I loved the splits thoughts which actually did make me feel elegant – once sat on the ring you pushed your feet away and rest one set of toes on the ring while you stretch the other leg behind you. This is hard on the hands though as your gripping on the top of the ring – and by this point your hands are quite sore. The teacher was great – she showed you moves in great detail, encouraged the more hesitant among us to try different moves and really encouraged us to move outside our comfort zones. Last thoughts: expect to use your upper body a lot (and probably ache a bit the next day) and have sore hands – but to have a lot of fun too! You can try it via Class Pass or at Flying Fantastic. Happy flying!